A place to ponder over the sublime mysteries of Ancient Craft Masonry, and those things appendant to it or influenced by it. If you haven't done so yet, read my Introduction to the Allied Masonic Degrees, to which this post is a follow-up. The story of this degree contains events before, during and after the Biblical Flood. The apron and emblems of this degree are easily recognizable by the ark and rainbow motif, although the degree itself claims the original apron to have been made of unfinished lambskin. The historic prerequisite to be made a Royal Ark Mason is to be a Mark Master Mason, however, the degree has no connection symbolically or otherwise to the Mark degree. A brother is said to be "Elevated" to the Degree of Royal Ark Mariner. Earlier in AMD history, this Degree was conferred in separate Royal Ark Mariner Lodges which were “moored” to a Council of the Allied Masonic Degrees. There are still a few surviving RAM Lodges moored to Councils, but warrants are no longer issued for new RAM Lodges. Other than those remaining Lodges, the Degree, if worked today, is worked directly by the Council upon their own AMD members. Overseas, RAM Lodges are moored to Lodges of Mark Masters which work under a separate Grand Lodge of Mark Master Masons. The existence of Mark Grand Lodges is another fascinating study, worthy of its own lengthy discussion. It is fascinating to me that this Fraternity of Royal Ark Mariners exists worldwide, while being administered by three very different bodies of Masonry. The Principal Officers of a Lodge of Royal Ark Mariners represent Noah, and two of his sons: Shem, and Japheth, and the Lodge room is made to represent the Ark of Safety. Indeed, our Brethren of the nineteenth century considered Noah to be one of the Grand Masters of Masonry. (Do you?) He is a celebrated Builder, and a man of integrity in the face of great opposition (if not a little bit of a drunkard.) Indeed, the early brethren of our Craft did not hesitate to trace the line of Masonry even back to Adam in the Garden of Eden, who was the first to build an Altar (of unhewn stone, the Rough Ashlar), and the first man to don an apron (though his was of fig leaves.) While it is ridiculous to think that Modern Freemasonry was known to Adam or Noah, there is something inherently true in the idea that Masonry is heir to the fruits of the greatest and noblest accomplishment of a more primitive generation of man. The Royal Ark Mariner degree is special because it embodies this speculative reference to far antiquity, which if taken literally, implies that all of humanity was saved from the great flood by a Grand Master Mason. MASONIC SYMBOLS.—THE ARK AND THE ANCHOR. THE Ark and the Anchor sometimes represented separately, and sometimes conjointly, are symbolic of the safety and the sure hope of him who puts his trust in God, and walks in the way of God's Commandments. Tossed on a tempestuous sea of troubles, and exposed to many dangers in his earthly life, a good man is still preserved in safety, as Noah and his family were preserved in the ark, when it floated on the waters of the deluge, and all the rest of mankind perished. The ark refers our thoughts to this great historic fact, but at the same time leads us to think of that which even it symbolised or typified. As Noah and his family were saved in the ark, from the destruction which overwhelmed the multitudes of the unbelieving and ungodly, so all who put their trust in God are saved, whatever the dangers which beset them, and the storms which thicken around them. We read in the Epistle to the Hebrews, that "By faith Noah, being warned of God of things not seen as yet, moved with fear, prepared an ark to the saving of his house; by the which he condemned the world, and became heir of the righteousness which is by faith" (Heb. xi. 7). Even so, every believer, listening to the voice of God, and yielding a willing obedience, finds an ark of refuge ready, an ark which he does not need to prepare as Noah did, but in which he is in perfect safety. The anchor may be regarded as securing the ark from danger amidst the storms of life. Or by itself it may be accounted as a symbol of the security of a good man who puts his trust in God. And thus the figure of the anchor is used in Scripture, to represent the perfect security of the believer's hope. "Which hope we have as an anchor of the soul, both sure and steadfast, and which entereth into that within the vail" (Heb. vi. 19). The Anchor and the Ark remind us both of the dangers to which we are exposed, and of the refuge which we may find from them. They encourage us to choose and persevere in a right course, all dangers notwithstanding, and they assure us that if we do so, all shall be well. We shall not be overwhelmed in the surging billows; we shall not be driven from our place to be the sport of winds, and to be dashed by them to destruction; but we shall weather every storm, and find ourselves after all in a haven of peace and rest. It is a terrible picture of human life which is presented to us by the ark on the shoreless waters of the deluge; but we are comforted and encouraged by the thought of the safety in which it was preserved, till it rested on the mountains of Ararat, and its inmates went forth to enter on possession of the regenerated earth. Amidst the storm, a well-built and well-appointed ship rides securely at anchor in a good harbour, and we are encouraged to confidence of perfect security, as knowing how good both our anchor and our harbour are. But let us see to it that all is right, that ours is indeed a well-built and well-appointed ship, and our anchor is that which is "sure and steadfast." The very significant symbol now under our consideration, is therefore far from being merely intended to remind us of the deliverance of Noah and his family, the progenitors of the whole existing human race, from the deluge which overwhelmed the old world, and swept away the workers of iniquity, but still more to suggest to our thoughts those great truths which were typified even in Noah's ark itself, and in the salvation accomplished by it. "For Christ also hath once suffered for sins, the just for the unjust," says the Apostle Peter, "that He might bring us to God, being put to death in the flesh but quickened by the Spirit. By which also lie went and preached unto the spirits in prison; which sometimes were disobedient, when once the long-suffering of God waited in the days of Noah, while the ark was a-preparing, wherein few, that is, eight souls, were saved by water. The like figure whereunto even baptism doth also now save us (not the putting away of the filth of the flesh, but the answer of a good conscience toward God), by the resurrection of Jesus Christ: Who is gone into heaven, and is on the right hand of God; angels and authorities and powers being made subject unto Him" (1 Pet. iii. 18-22). Traditions of the flood are common throughout the world, and are found in the earliest records of ancient times, mingling with the other legends of all the mythologies, and with the accounts which different nations have received of their origin. These traditions have been sought out and compared with great diligence by learned authors; for they afford an important argument in favour of the unity of the human race, and of the truth of the Bible. We find the ark figured in the ancient monuments of Egypt; and we find in many other of the most ancient sculptures, and on coins or medals of various countries, not uncertain evidence of the prevalence of the tradition of the flood, and of the preservation of Noah and his family. The ark fitly symbolises the means of salvation. The flood rages around, but within the ark there is no danger. The perfect safety of those who seek refuge in it, is still further symbolised by the anchor. The ark is not represented as floating wildly, at the mercy of the winds and waves, but as secured by its anchor. And thus the believer has hope, "as an anchor of the soul, both sure and steadfast, and which entereth into that within the vail; whither the forerunner is for us entered, even Jesus, made an high priest for ever after the order of Melchisedec" (Heb. vi. 19-20). That hope cannot fail; disappointment is impossible; for it is a hope resting on the promise—nay, upon the oath of God; for "God," says the author of the Epistle to the Hebrews, "willing more abundantly to shew unto the heirs of promise the immutability of His counsel, confirmed it by an oath: That by two immutable things, in which it wns impossible for God to lie, we might have a strong consolation, who have fled for refuge to lay hold upon the hope set before us" (Heb. vi. 17-18). He is safe who puts his trust in the Lord. The fiery deluge of wrath shall sweep away the workers of iniquity; perdition awaits them; but the believer is free from danger. No billow shall overwhelm the ark in which he has taken refuge; and it cannot be wrecked by any storm. For further reading about the Royal Ark Mariner degree in particular, I refer you to "Following in Noah's Footsteps" at Freemasonry Today. 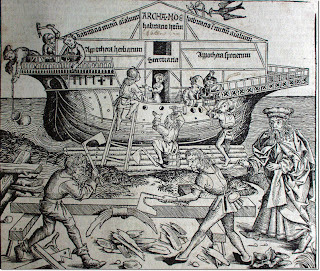 A woodcut from the Nuremberg Chronicle. Published in 1493. The series from which this image was taken were illustrated and engraved by Michael Wohlgemuth, Wilhelm Pleydenwurff and Albrecht Dürer. Delighted to hear you had a wonderful stay with us and that our penthouse floor exceeded your expectations, we really do appreciate hearing the great comments made after all of the hard work that went into both planning and building. The winter months with the wild seas and brisk sea air can also be a pleasure to experience so keep your eye on the internet and especially our web page for some great deals over the coming months. I will certainly pass on your comments regarding both service and food to the team as they strive to ensure that our guests have an enjoyable stay, so they'll be pleased that their efforts don't go unnoticed. We very much look forward to welcoming you back to our hotel very soon. To see more info please visit essayswriters.org/dissertation. Whether or not to become a Knight Templar.